In celebration of the centenary of Willis M. Hawley: Orientalist, Collector, Author 1896-1987, the Library of W.M. Hawley presents this edited Commemorative Edition. Limited Issue 2-Volume boxed set, 1050 pages, 8 1/2 x 11 softcover. 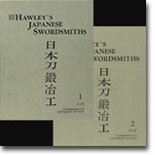 A compilation of over 30,000 Japanese Swordsmiths' names - where and when they worked and how they signed, Kanji and Romanization of names and signatures, with a relative value rating of their work. 1050 pages in two volumes.